Last January, the social listening platform Synthesio acquired Bunkr, a French startup once hailed as the definitive PowerPoint killer. When it first appeared on the presentation software scene six years ago, it dazzled users with the ability to quickly collect and organize content from the Web by simply copying and pasting links. From presenting videos and social media content to Google docs, it allowed people to create interactive business reports with online content -- in a fraction of the time it used to take with PowerPoint. Instead of copying and pasting screenshots from around the Web, users could present the complete interactive version of any site -- without disrupting the flow of a presentation. After six years of pursuing disaffected PowerPoint users, the startup decided to call it quits, leaving more than 150,000 subscribers without an online tool useful for presenting all types of Web content. RELATED: Visme Versus Google Slides: What's the Difference? Is Visme the Best Bunkr Alternative? For those searching for an equally “web-aware” tool, Visme is a very similar application that also allows you to embed all types of online content, from videos and maps to web pages and social media posts. 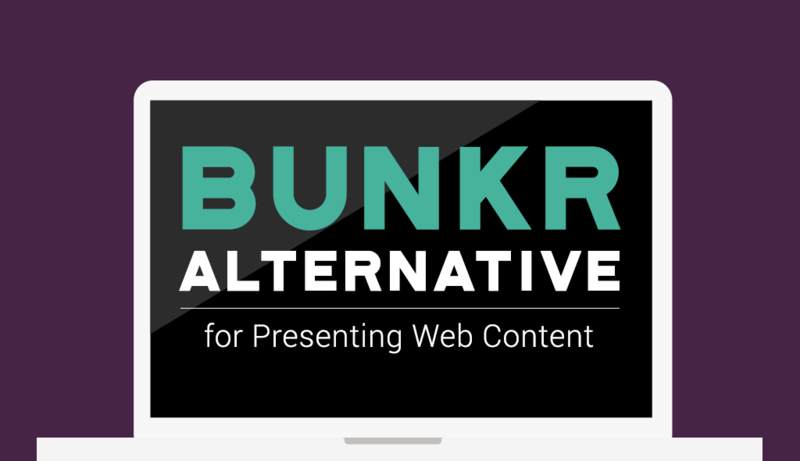 An online tool looking to differentiate itself from “old-school” software like PowerPoint, Bunkr specialized in the creation of web-based presentations. As such, you could embed online videos by simply copying and pasting a link. When viewing the presentation, all you had to do was click the Play button to watch the video without leaving the slide deck. 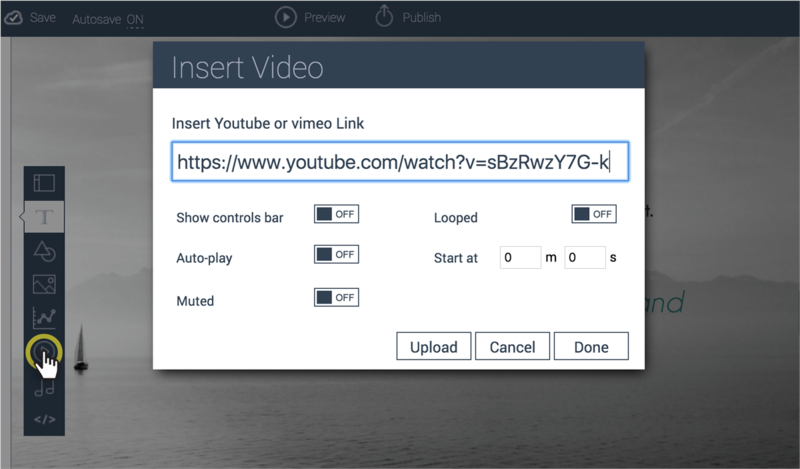 Visme also allows you to embed both YouTube and Vimeo videos by copying and pasting links, as seen above. 2 Present social media content. With Bunkr, you could present real-time social media content, such as tweets and live feeds. 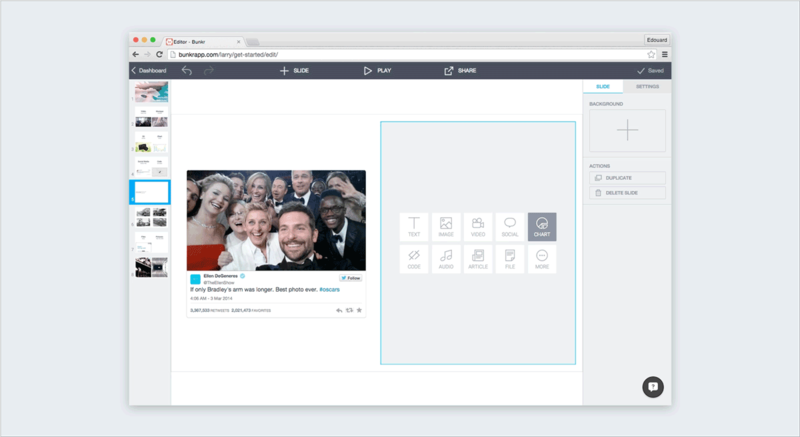 Visme’s Embed tool also allows you to insert virtually any social media profile, post or feed by copying and pasting an iFrame code. 3 Display charts and maps. Want to display a dynamic map of a city or region within your presentation? All you have to do is copy and paste the embed code generated by Google maps, Tableau or any other map tool. The difference between Bunkr and Visme is that you don’t have to go to a third-party app to create your own interactive maps. Within the Chart and Widgets tool, you’ll find the Map option, which allows you to insert your own geographical data, automatically color code regions and generate hover-over captions. 4 Embed and record audio. Embedding audio files from SoundCloud or any other audio platform is also possible with Visme’s Embed feature. As with other features on this list, you can also satisfy this need from within the tool. Visme not only comes with a built-in audio library with dozens of free audio files, it also allows you to upload your own audio files -- and even record your own within the tool. This is especially useful for creating voice-overs and narrated presentations. This is especially useful in cases where you want to interact with a specific web page in real time without leaving your presentation. Using the same iFrame provided above, you can also display and interact with any online files, such as Google docs and online Word documents, as seen above. This may come in handy in cases where you want to take notes during a presentation and don’t want to interrupt its flow by opening another tab. 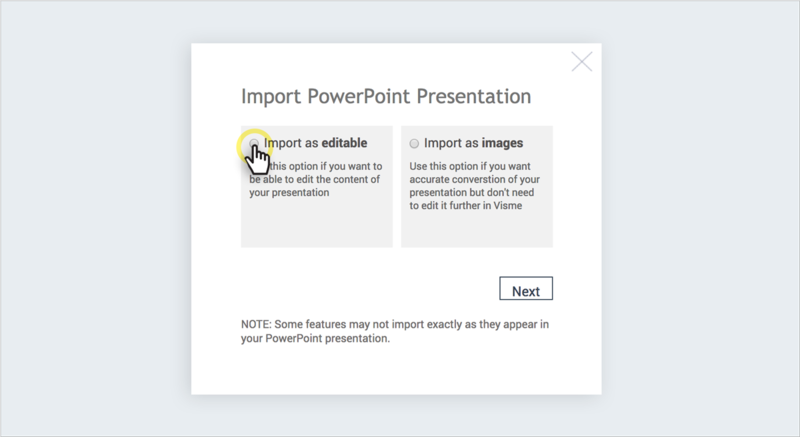 Like Bunkr, Visme also provides the ability to import PowerPoint files, as seen above, which can be useful in cases where you want to update and reuse an old slide deck. 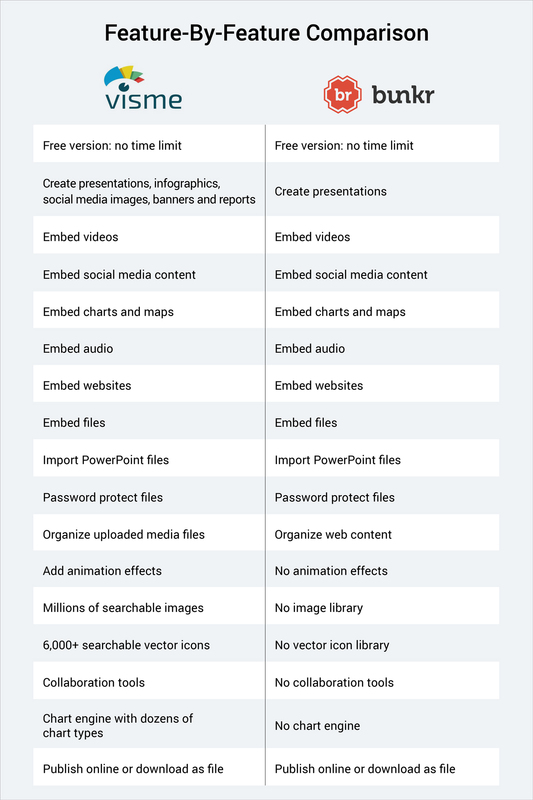 RELATED: Visme Versus PowerPoint: Which One is Right for You? Unlike Bunkr, Visme offers the ability to add animation to any object on your canvas area, which can help draw attention to key points in your presentation. 9 Use built-in graphic assets. Another huge advantage to using Visme is the fact that it comes with built-in icon and image libraries. No more searching the Web for images and other elements to spice up your presentation. Everything you need is in one place, with more than a million free searchable images and 6,000+ high-quality vector icons. 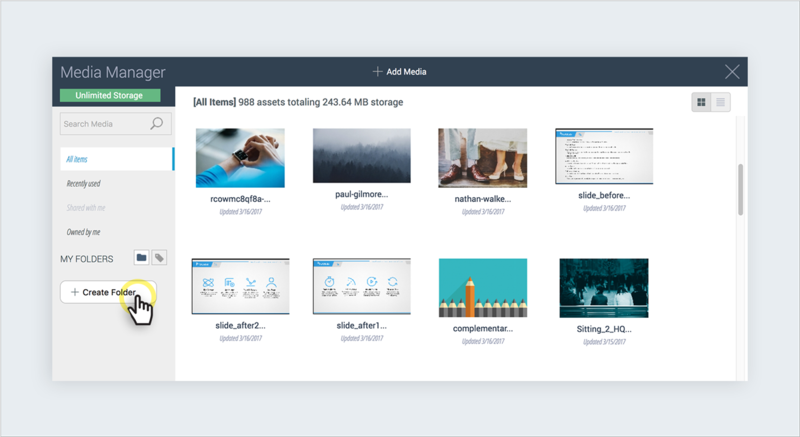 10 Organize and manage media files. 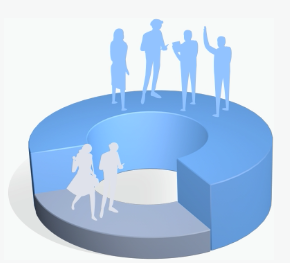 Ever wanted to reuse an image from another presentation but forgot where you saved the file? Visme solves this problem with its media library. 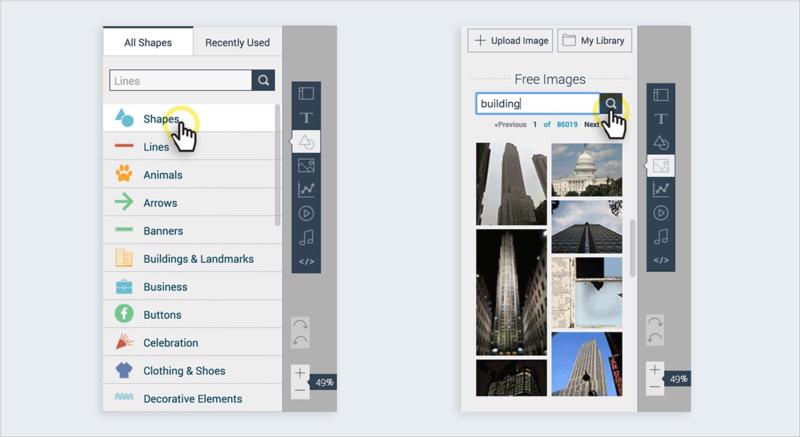 Here, you can tag and name all your uploaded image and icon files and organize them into folders so you can easily find them in the future through its built-in search function. 11 Collaborate with team members. 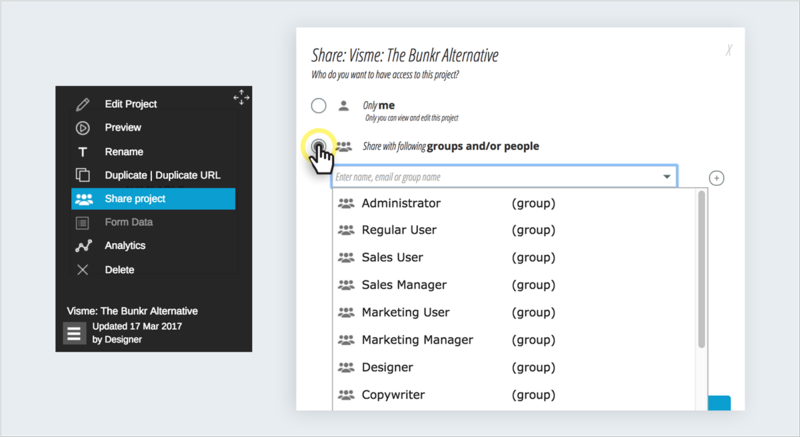 Visme also outperforms Bunkr when it comes to collaboration features. 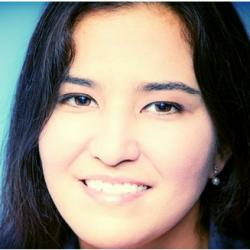 It allows users to share files with team members so they can edit and modify any element. With its team plans, you can also set access permissions and view the revision history of any file. 12 Publish online or download as a file. 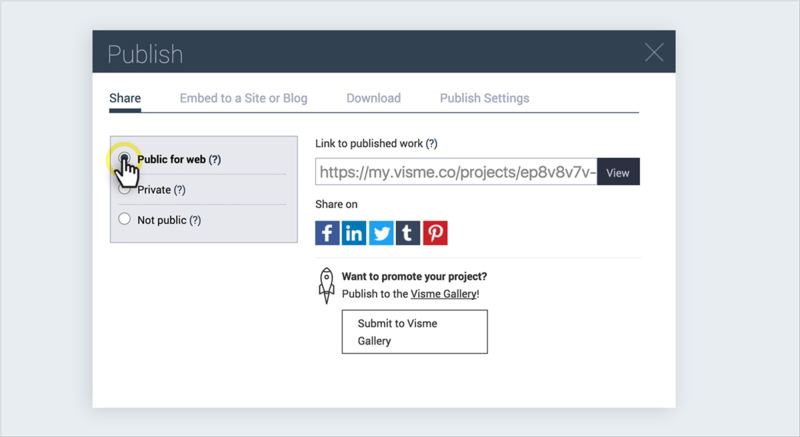 Finally, Visme also caters to many different needs by allowing users to either publish their presentations online or download them for offline use. You can download as a PDF, JPG, PNG or HTML5, which allows you to conserve interactivity and animation effects, useful for presenting in settings where there is no WiFi access. In sum, Visme is a powerful all-in-one visual content tool that allows you to go beyond Bunkr’s collect-and-present core function. For users who need to create presentations from scratch, and may not have ready-to-share files scattered across the Web, Visme is an attractive option which gives you everything you need in a single place -- with one easy-to-master learning curve. You can decide for yourself if Visme is right for your needs by signing up for free here. And if you have any questions or feedback, don’t hesitate to share them with us in the comments section below! Thanks, Tammy. Glad it inspired you to create your own blog.